Well, go figure. My very most popular post by far this year was one I wrote for Women's History Month that had very little to do with the Birth Story per se. 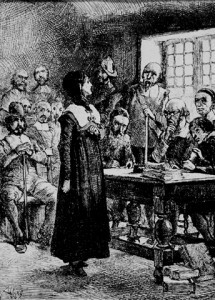 My top post for 2010 was about Anne Hutchinson, a midwife in the Massachusetts Colony, who deftly though unsuccessfully defended herself against heresy charges in 1638. The colony's governors were so shaken that they embedded into the mission of the new Harvard College the mandate to train religious leaders rigorously enough that they would never again be so intellectually pummelled. Anne figured in another top post as well, "A monstrous birth," about the danger midwives and mothers alike faced after anomalous births in the American colonies. My second most popular post was a recent one about Ian Shapira's Facebook-driven story in the Washington Post chronicling the death of new mother Shana Greatman Swers. Supermodel Gisele Bundchen came in third with a post about her much ridiculed assertion that all new mothers should be required by law to breast-feed.